".....the target audience for greener design should start with the building development and property management community." Make the approach Top-Down rather than Bottom-Up: Whether your goal is a single green building or initiating a complete green building program, don't put your focus on selling architects and engineers on the merits of green building design. Rather work on the principals; the building owner(s) or government agency that manages the real estate. Architects and engineers don't have much success in pursuing green agendas on their own. When green concepts are introduced by A&E firms, they are often seen by the Owner as a way to increase design fees after the fact, so resistance is common. On the other hand, green or sustainable building design practices are much easier to implement if an Owner includes such criteria in the scope of work before a design contract is negotiated. Also, educating building owners on the value of a green design is typically not a difficult task. Green designs do not have to be more costly, and green design practices can be shown to add value to many commercial properties. Thus, the target audience for greener design should start with the building development and property management community. Provide an integrated design: Often design processes dictate that a financial evaluation is to be made for specific "green" measures that can be applied to a project. However, the most effective green design is almost always a fully integrated design whereby architectural, mechanical and electrical systems all interact to minimize size, waste, energy use, and other negative impacts on the environment. Such designs cannot easily be picked apart into individual elements or measures that might be omitted for cost savings. More frequently a requirement to evaluate individual measures results in a flawed conventional design to which only marginal green measures are applied as options. Such a design process rarely leads to the most effective green or sustainable design alternative. Rather than fall into this trap, designers should work with the Owner to develop realistic criteria for the building project and provide a fully integrated green design that meets these requirements. If the Owner does require that conventional design alternates also be evaluated, do not try to combine the two designs. Rather, provide them as entirely separate design alternates with first and long term costs and revenues clearly spelled out for each. Don't work in isolation: There is a wealth of information that has already been developed on green building approaches, and a number of excellent examples of many types of buildings have already been successfully constructed. There are also a large number of successful green building programs and rating systems that have been implemented around the world. Information about successful projects and programs is readily available over the Internet, and many of us who work with green projects and programs are anxious to help get others started in their quest by directing them to sites that may contain information they seek. An e-mail to a colleague that is known to have some experience in the type of project or program desired will almost always be well received and lead to helpful advice and/or sources. The design process is the key to success: Another theme that echoed throughout the conference is the need to change the way the design team interacts in order to develop effective green designs. Getting a design team to really act like a team is not a trivial matter. Design team members all too frequently try to minimize communication among the various disciplines because each is not organized to work effectively with "outsiders" in their day to day activities. However, well integrated designs require a much higher level of interaction to optimize the interaction of the various building systems with one another and to be creative in exploring new opportunities the project may afford. Communication need not become tedious or require long meetings. Modern communications techniques can permit close coordination and keep the entire team informed without unnecessarily burdening the team with excessive demands on their time to keep in touch. However, to be effective such communications processes must be carefully developed such that the process meets all objectives for effective management as well as coordination and flow of information. Maintaining an effective team also requires a team attitude on the part of each member which includes the willingness to consider ideas from other disciplines and provide suggestions without being overbearing. Think green in all your work: For my presentation I showed the group how applying integrated network control concepts can reduce HVAC energy use by 30% to 50% below the energy requirements for the same equipment with the types of conventional controls that are currently employed. I also discussed the unfortunate fact that at times technology is seen as an enemy of green building designs. This view may be fostered by the narrow focus engineers too often apply that results in "brute force" comfort system designs. Engineers especially need to broaden their thinking in HVAC designs. On the flight home I read an article about a small (750 ton) chiller plant that was highlighted for its high-efficiency. However, it had 15 different pumps, numerous sequencing and constant flow valves, and complex chilled water, condenser water and secondary distribution systems. From my perspective, the design failed because the focus was too single minded. Had construction, embedded energy, operation, maintenance and decommissioning costs all been considered together as green thinking requires, a simpler and much more effective design with even lower energy use probably could have resulted. Broadening our thinking to a "green" perspective helps us do a better job in all the areas of our responsibility. So, these are some suggestions that were introduced by some of the more experienced green designers and thinkers from all over the Pacific Rim and Asia. 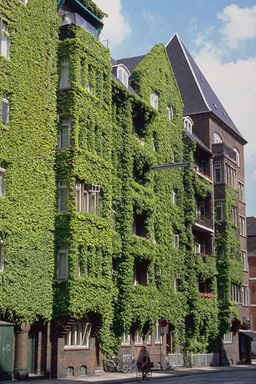 Many of these ideas will be familiar to those who have been working toward greener buildings. But whether you are already an experienced green designer or still looking for your first opportunity to show your capacity for green design, by combining these pointers with your own good ideas, you will surely contribute to the green revolution! Comments and questions about the article may be addressed to Mr. Hartman at tomh@hartmanco.com. Additional information on network based low-energy technologies is available at http://www.hartmanco.com. If you are planning to attend the ASHRAE Winter Meeting in Atlanta, Mr. Hartman will be speaking at both a Symposium and Seminar on the topic of low energy network based chilled water plants. See this month's ASHRAE Journal or visit the ASHRAE web site at http://www.ashrae.org for the complete technical program schedule for the Winter Meeting.